Summer Couscous, Thyme for Cooking pasta side dishes. Couscous is not a grain but a tiny semolina 'pasta'. What is normally available is a pre-cooked product to which we just add boiling water or stock... making it very quick, perfect for summer, or anytime! Chop pepper and courgette, snip chives and halve tomatoes. Put couscous, pepper and courgette in a medium bowl. 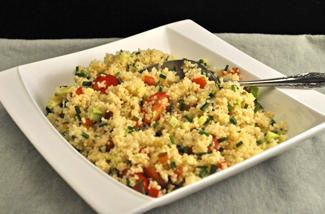 Uncover, add chives, tomatoes and oil to couscous, fluff gently with a fork to combine and serve.